Scones are amazing for a number of reasons, quick and easy being right up there with buttery, flaky, and delicious. Just measure out flour, baking powder, a pinch of salt, and a spoonful of sugar. Whisk together and cut in cubes of butter with a knife or pastry blender. You can use a food processor, if you like, but that always seems like way more effort (and more dishes) than I want to put forth first thing in the morning. Stir in diced apricots and chopped tarragon, then pour in cream and stir until just combined. Turn the dough out and press into a circle. Cut in 8 wedges, brush with a touch more cream, and sprinkle with sugar. Transfer to a baking sheet and pop ’em in the oven until the tops are golden. By the time your coffee is done brewing, they’ll be ready and waiting. Grab the paper and your coffee and head out to your patio or the nearest patch of grass and eat your scones al fresco. 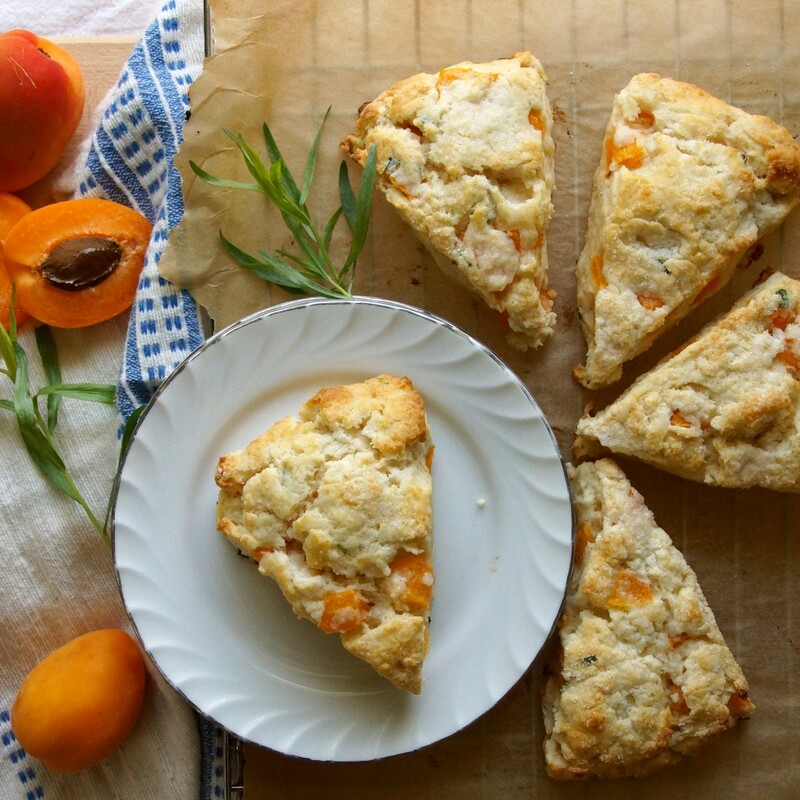 Kick up your feet for a moment and slip into buttery, apricot and tarragon breakfast heaven. Today’s off to a good start. 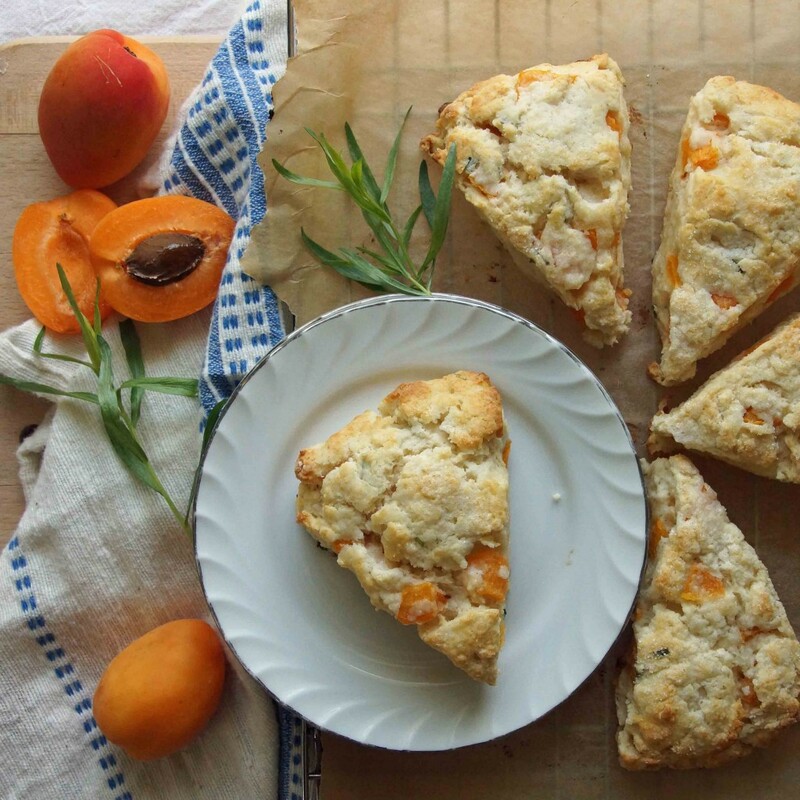 These scones would be just as good made with peaches or nectarines if fresh apricots are unavailable. Whisk together flour, 2 Tbsp. sugar, baking powder, and salt in a medium bowl. Scatter the cold butter over the dry ingredients and cut in, using a pastry cutter or 2 knives. If you prefer, you can use a food processor. Cut or pulse until the mixture resembles coarse meal (it's okay if there are some larger pieces). 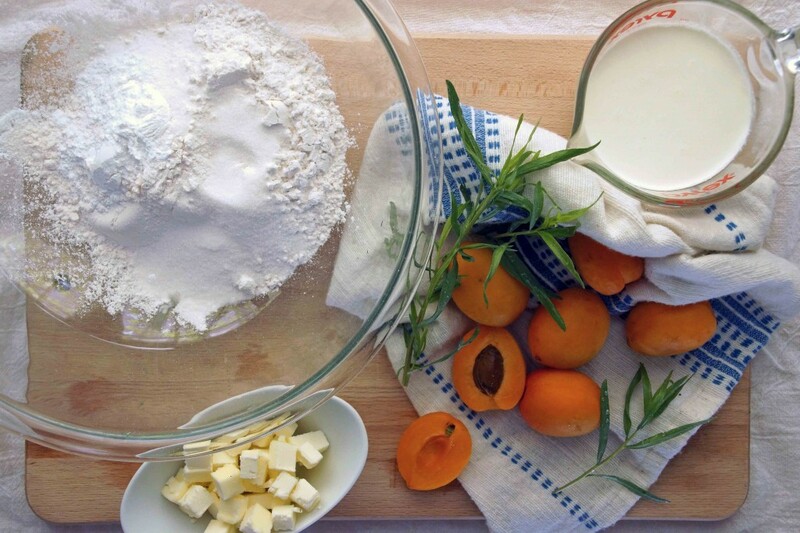 Stir the diced apricots and tarragon into the dry ingredients. Add 1 c. cream and stir until the dough just comes together. 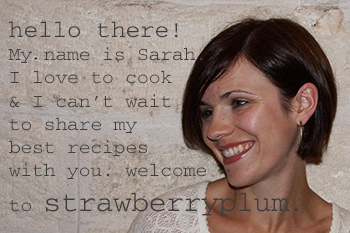 Turn the dough out onto a floured counter or board and knead once or twice to help all the floury bits stick together. Press the dough into an 8-9 in. disk and cut into 8 wedges. Transfer the scones to the prepared baking sheet, brush with the remaining 1 Tbsp. cream and sprinkle with the remaining 1 Tbsp. sugar. Bake until tops are lightly golden and the center is no longer doughy, 14-15 minutes. Allow to cool for 5-10 minutes before serving. Wow!! These were amazing!! I added some vanilla and let them chill in the freezer for 30 min like some other recipes suggest. I also threw in some rosemary with the taragon. They came out amazing (if a tad less fluffy b/c I added the cream before the butter… oops). Thanks for the recipe! I bet the rosemary was a nice addition–I’ll have to give it a try next time! These are wonderful! 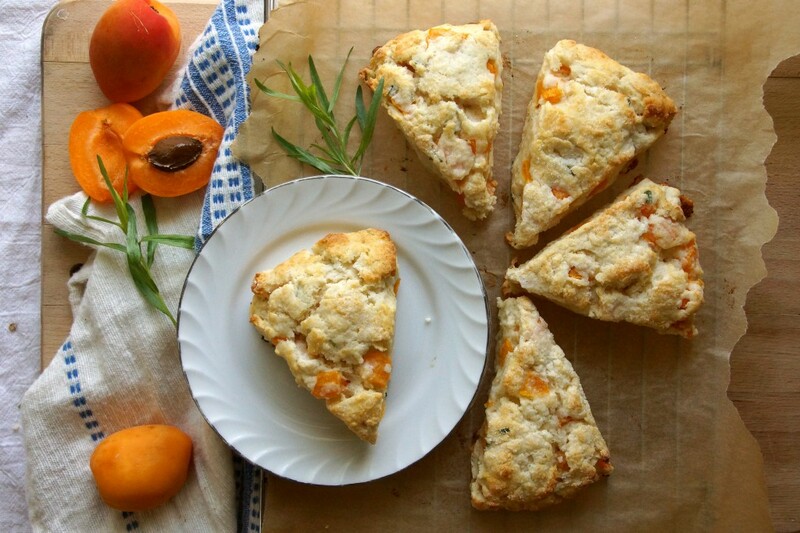 My mother had some apricots that she didn’t know what to do with, so I’m glad that I stumbled upon this recipe. Melt-in-your-mouth goodness, absolutely delicious. I forgo-d the tarragon, added a little vanilla, and subbed about a tablespoon of the cream out for whole milk. I can’t wait for friends and family to try them.